Stanton (biceps) could resume swinging a bat when the Yankees return to New York next weekend, Lindsey Adler of The Athletic reports. Stanton is in the midst of a 10-day shutdown period before the Yankees clear him to start up baseball activities again. 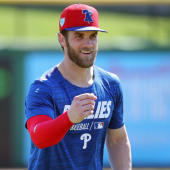 It's expected that he'll be limited to dry swings initially, but he could hit against soft-tossing pitching soon after that if he's healed from the left biceps strain as anticipated. The Yankees haven't ruled out a late-April return for the slugging outfielder.